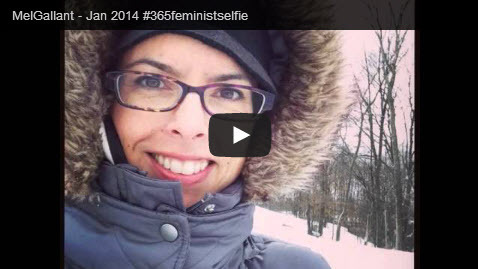 For the past 63 days I’ve been participating in the #365feministselfie photo challenge, created by Veronica I. Arreola. I first heard about it through Instagram a day or two after reading James Franco’s New York Times article on The Meanings of the Selfie. I loved that Veronica quotes from James Franco’s article on how “attention is power.” Because it is. The project is about owning (and sharing!) images that represent our true selves. Who we are, what we’re feeling or focused on and how it can all change day-to-day. This challenge is so fun. And so hard! I’ve only been posting my #365feministselfies to Instagram so far…for some reason I feel more comfortable sharing myself there. Maybe that will change over time. Taking a photo of myself everyday, especially on days I feel crappy/grumpy/less-than-human, requires stepping out of my comfort zone. But stating those feelings when sharing such a photo is surprisingly liberating. This is me at my best. And at my worst. It’s me telling the world to take me as I am. But it’s also me telling myself that. There’s a bit of self-forgiveness and self-acceptance happening here. And I’ve met so many interesting women. Gained a short glimpse into their lives. It’s all so cool. 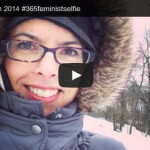 Check out what I’m talking about by following the #365feministselfie hashtag on Instagram, Facebook or Twitter. What about you? Are you participating in this project or a similar one?